You know the musical scores that accompany movies, amplifying the mood of each scene? These musical accompaniments used to be performed live in the movie theater by a band of talented musicians. 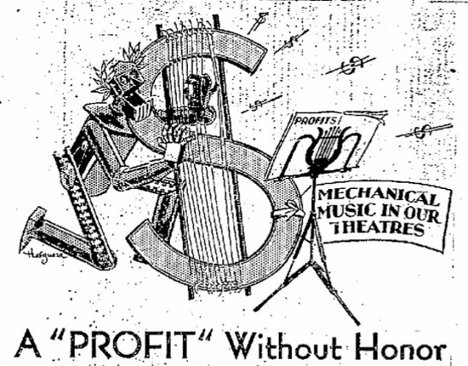 As of 1927 and the release of the movie The Jazz Singer – in which synchronized sound was used for the first time – the bands’ services were no longer required. Rather than sitting back and watching their livelihood disappear, the former theater musicians decided to take a stand against the changes happening in their industry. 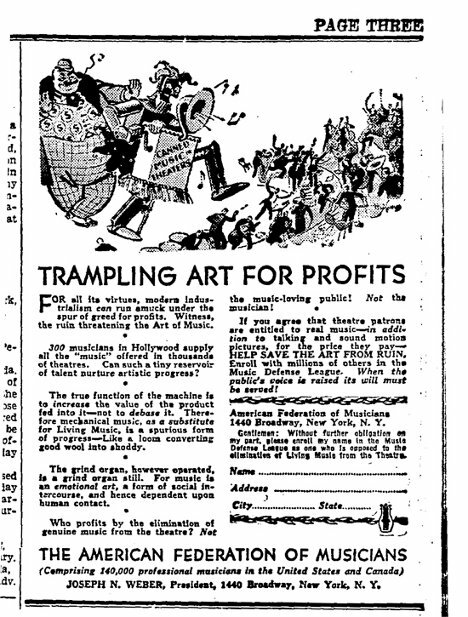 In 1930, according to The Smithsonian, the American Federation of Musicians came together to form the Music Defense League. 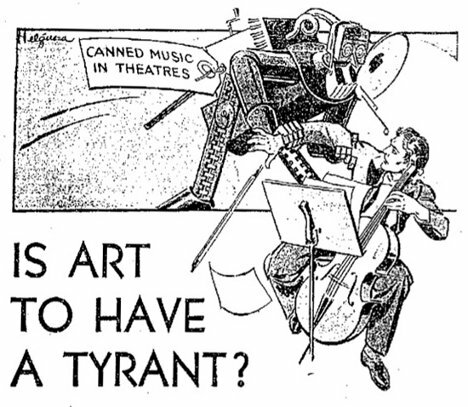 The new organization’s goal was to defend the careers of musicians who would be displaced by the “robot music” being played to accompany movies. 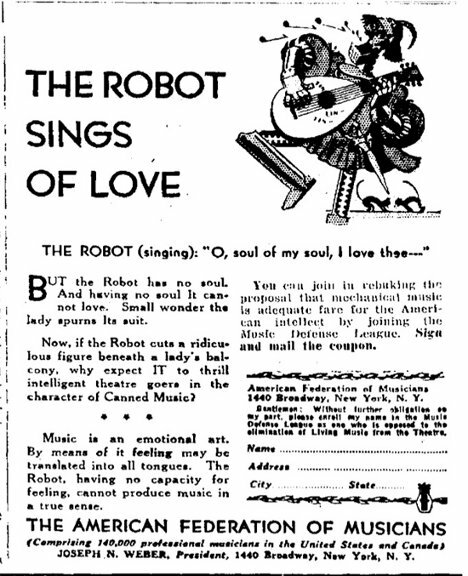 The organization spent a staggering (for 1930, anyway) $500,000 on an ad campaign imploring the American public to refuse the “robot music” and insist on real, live humans on stages and in movie theaters. 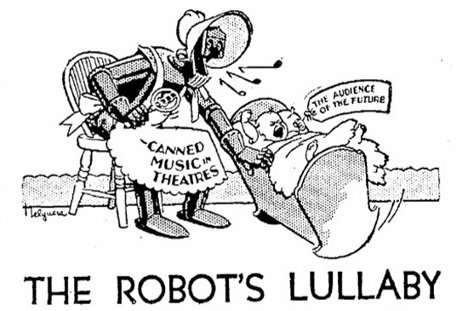 The ads featured a robot as the representation of recorded music. 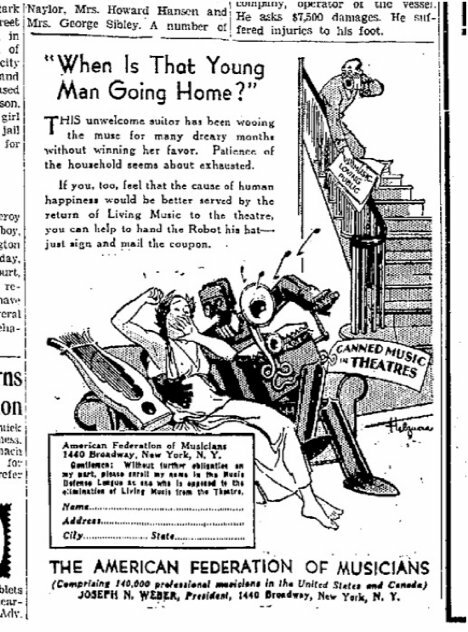 In various pictures the evil robot seeks to wrestle music culture away from real artists, seduce an innocent young girl, and physically harm human musicians. They were right, of course, to a certain point. After that time pre-recorded music slowly began to surpass live music in popularity. But today in our technology-loving society, we see this as a good thing because it allows more people access to a greater variety of music. As the Music Defense League predicted, there is now a relatively small pool of musicians who provide scores for motion pictures. 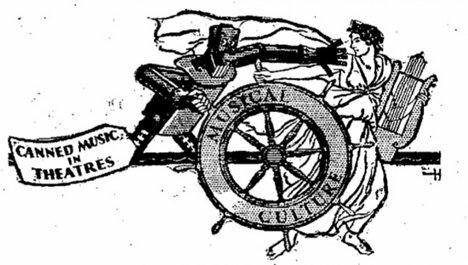 But luckily for us, our modern recording methods have allowed us to hear music from all over the world. 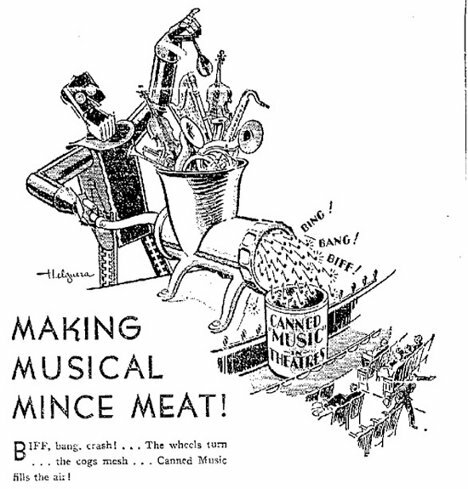 See more in Aged Adverts or under Vintage & Retro. February, 2012.